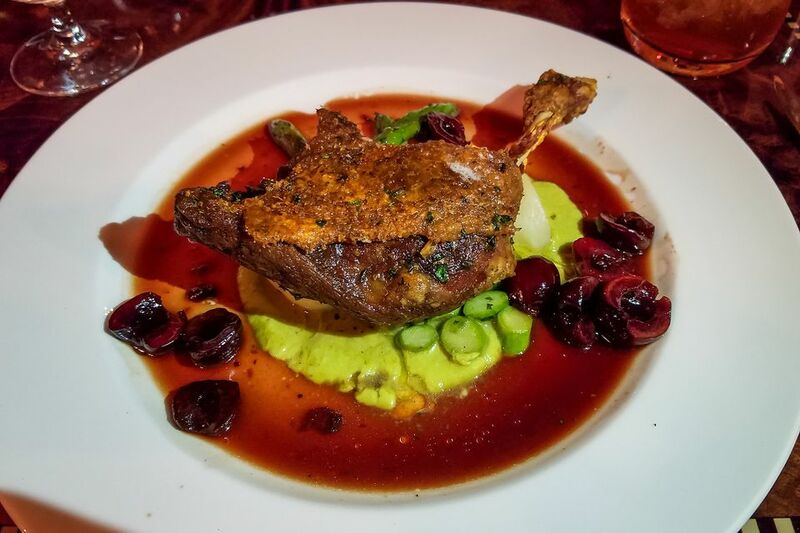 Crispy Maple Leaf Duck Confit with Delta Asparagus, Baby Turnips, Cherry-Ancho Chili Vinaigrette -- Carthay Circle Restaurant. Confit (pronounced cone-FEE) is traditionally a technique for preserving poultry and meats such as duck, goose or pork that involves cooking the meat in its own fat and then storing it in this fat in a covered container. Confit is an effective method for preserving meats because the fat seals off the oxygen that bacteria need to reproduce. The word confit can be used to refer to the technique, or to the meat which has been thus preserved. Food needs these six factors to contribute to food spoilage. Bacteria are tiny organisms, which, like us, need food, water, and oxygen to survive. So depriving them of one or more of these things kills them, and voilà! Your food is preserved. Today, it's possible to find restaurants that serve confits made from vegetables or fruits. These aren't true confits in the sense of meat which is preserved in its own fat. Rather, they're more like jams or chutneys. Fruit or vegetable confits are usually preserved using sugar rather than fat. The term confit is now often used in restaurants to mean food that has been slow cooked in fat at a low temperature. Like many classical food preservation techniques, confit belongs to the area of the culinary arts known as garde manger. To make a classic duck confit, you'd first season duck legs with salt, brown sugar, garlic and fresh herbs such as thyme and other spices. Then, the duck is simmered in duck fat and water for a few hours. The water will slowly cook off while the fat remains. Cool to room temperature and then refrigerate the duck in the fat. When you're ready to serve, remove the duck from the fat, and scrape off any excess. But don't discard the fat! You can use it to make confit again, and it's incredible for frying potatoes. A great way to serve this would be to warm the duck legs in the oven, fry some potatoes in duck fat and then serve with frisée tossed in a simple mustard vinaigrette. You'll note that duck, goose, and pork are all foods that come from animals with a relatively large percentage of body fat. It is the fat that makes confit possible. This is why you don't tend to see confits made from chicken or turkey since they are comparatively lean and thus lack the requisite fat content to make a proper confit. While a true confit cannot be made from fruit, a fruit confit refers to a fruit that is being preserved using sugar. This process is more commonly known as candied fruit. For fruit to be preserved this way it must be fully infused with sugar, which can take days or months depending on the size of the fruit. It's uncommon to see larger fruits preserved this way and when they are the result is usually quite expensive. Candied fruit is a tasty treat but due to its high sugar content isn't very good for your waistline. Are the Health Concerns About Nitrates Overblown?